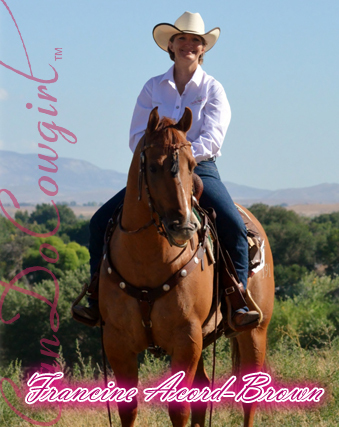 "I am a 45 year old cowgirl that started riding about 9 years ago. I had several not so serious accidents. I would fall off or get bucked off. I would break a wrist, foot, arm and leg. After a few years of various falls I found out I had Osteopenia, that turned into Osteoporosis. I found out I had a passion for horses and wasn't ready to give it up (against my doctors recommendation and husbands request) My mom was diagnosed with COPD 2 1/2 years ago and she liked to see pictures of riding and hear me talk about it. I joined a Rodeo association for the 1st time this season and I dedicate every run for mom. My mom lost her battle June 28, 2016. I ran barrels on July 2nd and 3rd at a rodeo with my best times ever! I know it was her finally getting to see my run from above. Thank-you for this awesome opportunity." "Hey there! I’m Autumn Hovarter from China Michigan! I grew up in a small town showing western pleasure and barrel racing. At a very young age I won the Quarter Horse Hi- point belt buckle and received the gold ticket to compete at Detroit State Fair with my Pole Bending horse. My early years being a member of the L’Anse Creuse High School Equestrian Team I received my Varsity Letter. My boyfriend and I own KnA Farms; we raise Nigerian Dwarf Goats, Pheasants and Chickens. We have a donkey named “Murphy” and an AQHA colt named “The French Bandit”, we also offer high quality tack and ranch supplies. 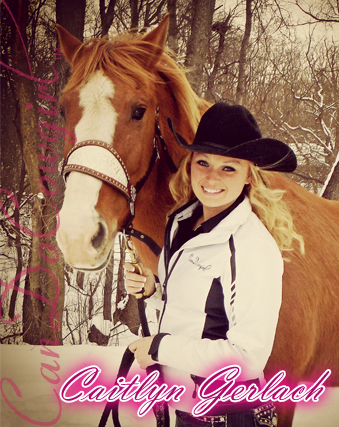 I am a horse trainer, and offer training in colt starting, western pleasure, hunter under saddle and barrel racing! I am a very ambitious and determined barrel racer that has very high goals for my future with my barrel colt. I believe in being courageous and determined by sticking with the goals you set because ANYONE can do it!!! That’s exactly why I am blessed to be a part of the Can Do Cowgirl Team; I really know we can all make a difference. 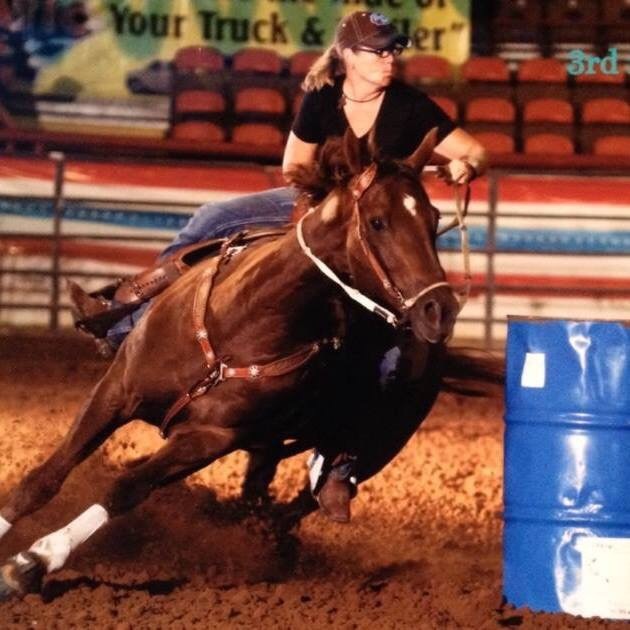 "I am a barrel racer from South Carolina who recently got back into racing after a personal injury in my spine/back, as well as a hoof injury with my horse. We both took over a year off to recover, unsure of our capabilities on return, if any. We are both just fine, and coming back with all the heart and try we have to offer. I have felt discouragement, and fear, but I believe that if you think even for a moment no one notices you, or no one believes in you…that you aren’t looking far enough past your horse’s ears yet. There is ALWAYS someone pulling for you. Here at Can Do Cowgirl you have the power to Empower yourself and others. Be a bright shining star, so others will have something to follow in the dark. I’m out here doing my thing, riding my horse, working my job, working on my Master’s Degree, and anything else I want to achieve. I’m not special, and I’m not doing anything that anyone else can’t do. I CAN DO, and as a CAN DO Cowgirl, I WILL. "Everyone has a story to tell, and a goal to reach. Me? Heck yeah! I started riding just after I graduated, in the summer of 2014. I had always dreamed of being that girl that runs barrels in the rodeo, but I never had time in high school due to sports. After I graduated I decided I'm done dreaming and hoping, I am going to do it. I was introduced to the lady that became my friend and my biggest aspect to my dream, Alicia Johnson. She allowed me to learn on her horses, and she teaches my every small detail about horses as she teaches me, I rode Leo, an Appaloosa my first summer, Leo will always hold a special place in my heart because I learned the basics on him! Stoney and I have competed in numerous WSCA shows and we went and ran barrels one night also, and we are doing excellent together. We competed in things such as pole weaving, barrels, etc. It's amazing how fast you can love a sport, and horse riding is definitely a sport, being a varsity athlete all my life I can personally say this is one of the hardest sports and at times it can be frustrating, I mean your teammate is 1,200 lb. animal, but the passion I have is unbelievable. I was always an athlete, a "track star" as most people new me. I broke school records and won a lot of races, and in middle and high school I lived for track, I got into my college now University of Wisconsin Eau Claire because they wanted me to run for them, and even more this was the school I wanted to go to! So it was a win/win. Or I thought, I was diagnosed with RA my sophomore year of high school and my orthopedic doctor had told me I also had tendinitis in my knees, and that my joints were aged about 10 years then I was. My body just was breaking down from playing sports for so long, I pushed through high school and once college athletics got a hold of me... Well things went from bad to worse. I got a stress fracture in my tibia that almost broke my leg. Not long after that my knee started acting up again with the RA and tendinitis and also I got a kick to my knee from a horse and that caused liquid around my knee cap, and calcium deposits in my muscle. Most importantly I realized that I was not enjoying what I use to love, I was always hurting, and running just wasn’t the same anymore. So I stopped running at the collegiate level. I am still so blessed and thankful I had the opportunity to run at that level and it will always be something I remember. Fall 2015 will now be my sophomore year of college and I will be trying out for our Equestrian Team in Western Pleasure. After a year of that I am going to decide if I want to stay there or join the intercollegiate rodeo, and compete independently, because our school doesn't have a rodeo team, and one day I am beyond determined to be a professional barrel racer. After I graduate from college I hope to move out to Montana and be working in my field (criminal justice) so that I can support my love for horses with my own ranch where I will hope to have horseback riding lessons, clinics for barrel racing, camps, boarding, etc. I am just beginning my journey, but I have a goal and I will not stop until I get it. I think courage is trying something new, and to keep working until you are successful no matter what others have to say about you on the way. Dream on!" "Hello everyone my name is Lexi! I grew up having dirt on my jeans and a pitchfork in my hand. Hard work is in my blood and I can't imagine it any differently. I have been working with horses ever since I was just a little sweet pea. I have been bucked and threw a time or two, landed on my face but I get up, dust off, and climb back into that saddle. Nothing will ever break my love for these amazing creatures that we are so lucky to have in our lives. I am one proud women to be a representative for CanDoCowgirl and I am beyond thankful for this opportunity. "I'm Sarah and this is my 13 year old mare bug. I've always dreamed of becoming a barrel racer and my horse has made it come true. She's taught me that you can never give up and if you truly want something you have to work for it. You need to practice like you have never won, and compete like you have never lost. All thanks to my inspiring friends and family my dreams are coming true! " "Hi, my name is Anna Campbell. I am 19 years old and live in Colorado. I have been around horses and riding since I was 5 years old. Over the years I have competed in English and Western show, and hunter jumpers. The last 3 years, I have converted my riding career to barrel racing and rodeo. I compete locally, and around the state of Colorado. I am a part of National Barrel Horse Association, True West Productions, and the Colorado Professional Rodeo Association, as well as competing in local jackpots. In 2014, I placed second in the 3D for NBHA state finals, which qualified me for the NBHA world championships in 2015. I also placed second in the 2D for NBHA district finals. Horses and rodeo are my life, and I spend every weekend chasing that gold buckle dream. I am a 2015 high school graduate, where I have also been a part of FFA and agricultural classes. I am moving to Dillon, Montana in August, where I will attend The University of Montana Western, studying Equine Sciences and Natural Horsemanship and being a part of their rodeo team. I plan on getting a 4 year degree, and have the goal of after graduating being able to own a barn where I can specialize in barrel racing lessons, and training facility, as well as traveling all over for rodeo. I also want to push myself, no matter how tough things may get, because what comes easy won’t last, and what lasts won’t come easy, so I always want to work for what I want. 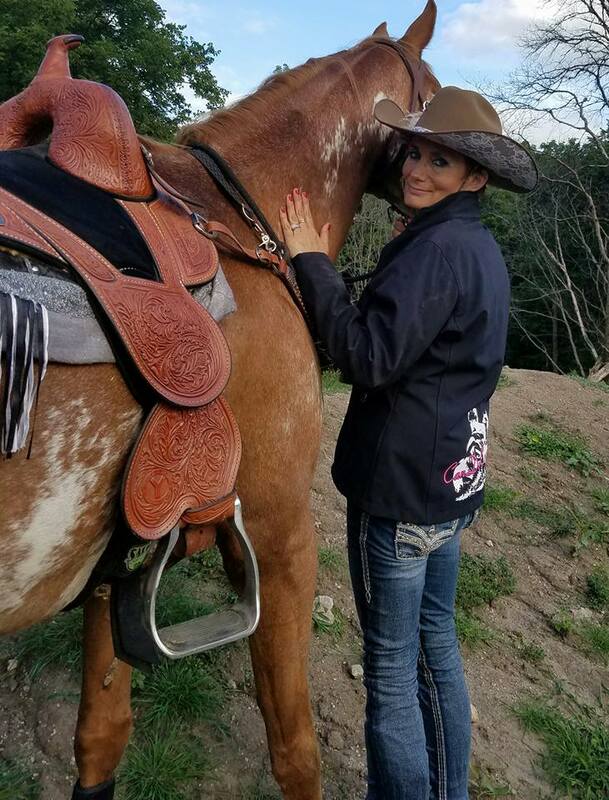 Being a part of CanDoCowgirl is a very big honor for me, as I am a person who is always wanting to try new things, meet new people, and get out of my comfort zone. I love to challenge myself, whether that be making myself a better person, helping others or overcoming any challenge life throws me. I believe that courage, grit and determination are some of the most important things in life to have, which is another reason why I am so glad I get to be part of such a great team. It will teach me so many things in so many ways, and be a real eye opener for me, and I can’t wait to promote CanDoCowgirl in both Colorado and Montana. " 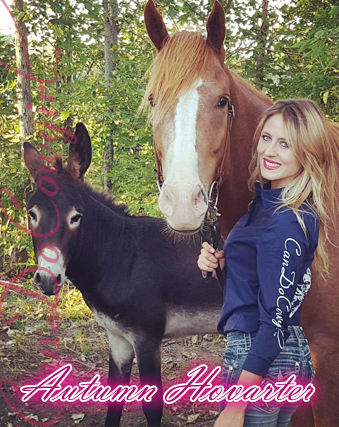 "Hi, my name is April and this is my 22 year old arabian horse, Star. We have been together for almost 2 years. We do pole weaving, and barrel racing through WSCA and 4-H. She has taught me how to push myself harder and pursue my goals and dreams. " "Hi: My name is Amy and I am 17 years old. So really happy to be part of this great team!! I live in the first great state of Delaware. I raise goats and chickens. I own a hedgehog as well as a dog so animals are my life and I am very active in FFA. Amy's courageous life story in full in on the courage page of our website." I do my best thinking when it's just me, my horse, my dog and my rig! I just hope that I can help people! It's just my life you know? It's like I get slammed with bad then embrace the good! I struggle. I really do. But having a focus really helps keep me going. Horses are such a strong influence in my daily life. I cannot imagine who I would be if I didn't have horses in my life! Read Rachael's story in full on the courage page of our website." "Hi: My name is Brittany and I'm 20 years old & living in PA. I have been riding my whole life and was born and raised on a farm. I love animals. I've always had the dream of becoming a barrel racer. I got my horse Beckham after having to put my first horse down. He is my pride and joy. We have grown together teaching each other something new everyday; patience, and team work etc. We would've never gotten to where we are now without the help from others and I couldn't be happier. " "Hello everyone! My name is Caitlyn Gerlach and I am a small town Wisconsin woman. I am a vet tech and a sole owner of a beef cattle company. I decided to join CanDoCowgirl because I truely believe in what we have to offer and how I can be a positive influence to the company. I am a member of NBHA, IBRA and the American Quarter Horse Association. I build my roots on agriculture and will continue to do so all my life. 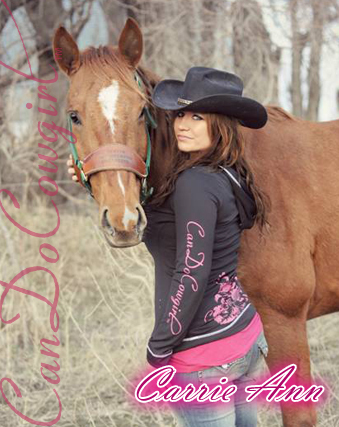 I am excited to see all CanDoCowgirl can do for me and how I can help the company as well. "I've barrel racing/rodeoing since I was 12. 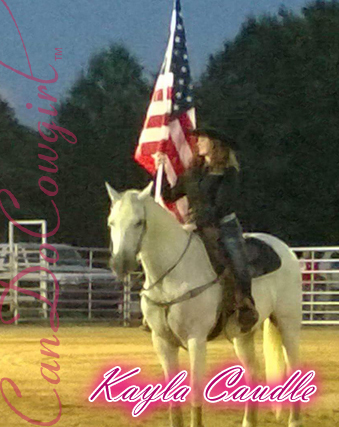 I have had the honor of presenting flags at the IFYR since I was 18 years old. For the last 4 years I have led free clinics in Arkansaw and Oklahoma helping girls and guys of all ages problem solve and tune their horses. It has been a rewarding experience as 1 of the girls won her first saddle last year. I create different prizes and awards and also give away a buckle to the participant who shows the best attitude towards not only their horse but others around. It's a great way to share my story of hardships and triumphs and encourage others to keep on pursuing their dreams. Keeping your head up and fighting for your goals is always important. My best friend Dudley Duwright means more than words to my family and I. He taught me how to lose and win everyday but more than anything he taught me how to keep working for what I want. Also won highest points for Sunshine Circuit plus more my horses have won highest point registered quarter horse. I travel the rodeo scene nearly every weekend all over Australia and have a passion for horses and my hobbies. 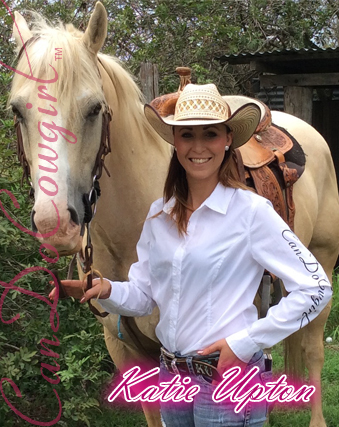 I'm excited to help promote CanDoCowgirl all over Australia." 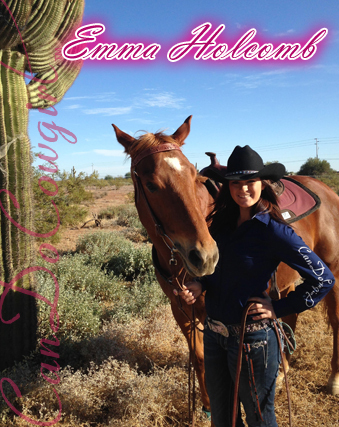 "Hello, My name is Emma Holcomb and I have been riding horses since I was two years old. I started training horses when I was thirteen. Training horses and learning everything that I can about the horse world strives me to succeed in my dreams. My dream is to go pro in rodeo and compete along side my role models and inspirations. Growing up I was not very privilaged and I didnt have the fastest horses or the fancy trailers and tack. I learned how to barrel race by self teaching myself. My first barrel race I competed in I used my fathers roping saddle and his old rope horse. A few years down the road I competed at my first big NBHA barrel race. My horse and I were dropped off with only my entry fee, my gear and my positive spirit. I slept in my horses stall in the coldest time of the year in Arizona because I could not afford a fancy trailer or hotel room. I made sure my horse had enough food before I did. I walked away broke but at the same time rich with the satisfaction and experience that I made it. I recently just adopted a 6 year old Thoroughbred named Nefertini. I plan to train her myself and make her not only my horse but my partner, my best friend and a champion. 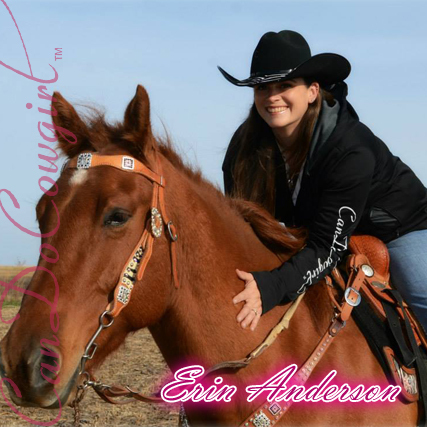 I love CanDoCowgirl because my struggles have become my strengths and helped persue my dreams. I plan to attend Oklahoma Pan Handle State University next fall and hopefully compete on their rodeo team. I will proudly represent CanDoCowgirl with honor, passion, and courage and strive to help others with their dreams and goals. " "Hi: My name is Erin Anderson. I truly live by the Never Give Up motto. There are days that I truly want to give up, but then I look at my horse in the pasture and look at my 3 kids. When I look at what all I have done for them, it makes me realize that it is going to be hard with 3 kids under the age of 7 to get all the wet saddle pads on my horse that I need to get, but when I work my horse and see his improvement it makes me feel proud of myself and am continuing to fight for my dream of getting back into the barrel pen. I’m also very glad for my support team that is helping me to achieve my dream of getting back to barrel racing. If it wasn’t for them (support team), the people I bought my horse from, and of course my horse, I don’t know if I would have had the drive and determination that they have helped me find again. My biggest goal that I am hoping to achieve with my horse Rock Bottom Red Rat is to make it to the NBHA World Championships in Perry, GA. Rat is a very special horse and he holds a very special place in my heart that only one other horse has held, Fred. Thank you for the opportunity to be a CanDoCowgirl Team Member. 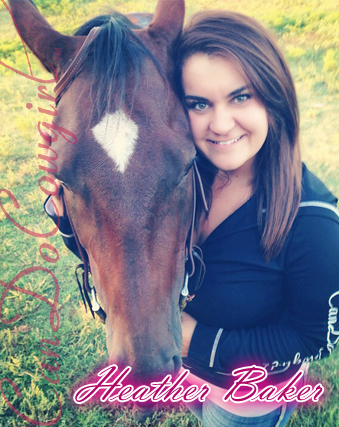 "Last year I hit the “Select” status with the AQHA, meaning with the big 5-0 birthday comes your very own World Show. That was the best news about that birthday. This year I qualified for the 2014 AQHA Select Show in Amateur Working Cow Horse Boxing. A milestone that until the last couple of years, was never on my radar. Last year I qualified and competed in my first APHA World Show. We won the first ever NSBA Ranch Pleasure Championship at the APHA World Show and my horse, I’ll Be Bud Lite was the first Paint horse to ever win a major NSBA Ranch Pleasure title. However, my personal scorecard isn’t about the outward wins that everybody sees, but the inner personal triumphs. I just started showing about 5 years ago. I grew up on a large cattle ranch, quit high school and went to work in the coal mines when I was 17. By the time I was 30, I was a single parent of two girls and successfully worked my way into the corporate world. A couple years later, I gave up the corporate life and moved back to rural life working every kind of job from Christmas UPS driver, Insurance Agent, Vet Tech, back to the family ranch and eventually back into the mining & construction industries. I didn’t know how to raise kids without cattle, horses, hay meadows and hard work. Both daughters became rodeo queens when they were teenagers. But at the same time, I had three cumulative accidents in a very short time that changed the course of my life forever. I suffered a Mild Traumatic Brain Injury (MTBI). I lost my management job at the molybdenum mine and started intensive rehab for more than 3 years. Doctors told me I would never ride again and they told me to sell my horses and move to Denver closer to the clinics. I knew in my heart that didn’t work for me, but I had no idea how I was going to do it. There was no evidence they were wrong, but I just couldn’t do what they were asking me to do. One day after a second neck surgery and complications with seizures, I had to get away from that hospital. I had a girlfriend come pick me up and we walked out of the hospital without even checking out. My mind was going crazy there and I had a mare about to foal. The hospital staff and doctors didn’t understand and I couldn’t take it. We came home and I went out to the pasture with my fuzzy slippers, neck brace and pajamas and cried on my oldest horse’s neck for a long time. I vowed that day “they were wrong” and had no idea what was in store. I had a long, long, long recovery ahead of me. Then my sister tragically passed away, and it was the start to many more heart wrenching trials and tribulations. Today, here I am 15 years later from the initial accident – doing more than I imagined in my wildest dreams. I now have a wonderful husband of 5 years who supports me in every way. We have a beautiful small ranch, a top of the line registered Black Angus herd which is now my real job. I research genetics and we produce high end seed stock for other breeders. I do everything from our repro work to run the office for our four businesses. Bottom line, I made a decision years ago. Others opinions and my circumstances can’t overcome my passionate hope and faith for better days ahead. Things didn’t turn around overnight and there were years of small progression, but I never lost sight of the bigger dreams to ride and maybe someday have a horse compete (back then I didn’t know it would be me riding them, nor did I realize it would be on a World Show level). But when all is said and done, this year we have four great show horses that I show in reined cow horse events and ranch horse pleasure. My husband Bob, has helped me to balance the needs of our cattle ranch and my 12 month a year show schedule for going on four years now, while he runs his own Corporation. I came off a horse the other day, the first time since the early 90’s. I have been a timid, hesitant rider, but I’ve really been working on getting more aggressive and really riding my horses. I did however, lengthen my stirrups for this particular horse not realizing the consequences. I blew a stirrup and lost my balance and hung off the side of him as he side passed (ok jumped around) to the other end of the arena. I almost recovered a couple of times, but after scaring him and realizing when I looked up I was looking at the pattern on his bit which was above me, and his wild eye was looking down on me. I was closer to the ground, than I was the saddle. My trainer, Brady Weaver told me to give it up. As much as I didn’t want to, I hit the ground. It took a couple of minutes, but I got up, put the stirrups where they were and successfully ran him down both ways again with decent stops. Brady said “you’ve got more try than I ever gave you credit”. We showed the next day and we ended up second in our class. It took a few weeks and massages to get the kinks worked out. When this Can Do Cowgirl opportunity came up, I mulled it over and thought I should seek my professional’s opinion. I asked Brady (who is a NRCHA 2A judge & AQHA Professional Horseman) if he thought I was a “Can Do Cowgirl” and if he thought I display courage, grit and determination. He replied, “Not until you came off Double the other day” (Double 07 is horse’s name). This man of few words that are typically painfully honest. Apparently I have now earned a “Rite of Passage” in his book. Seriously though, I don’t tell my story to look for sympathy, but rather to encourage others to never give up, don’t give into fear, and press on. This journey called life takes time – a lifetime. Strive to be a person of character, integrity and excellence. Not everybody can do it, but you can. Be the Can Do Cowgirl that only you can be! 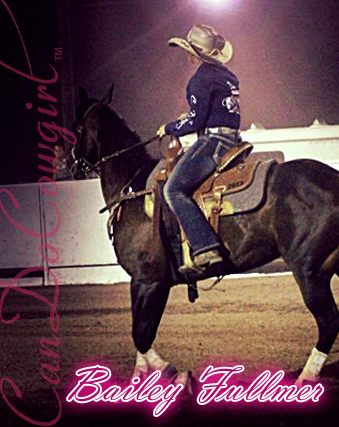 "Hi, I'm Bailey Fullmer, a 14 year old, all around cowgirl from the big city of Las Vegas. My life revolves around my horses and my roping. I guess I’ll start by saying I’m on the Las Vegas Jr. High School Rodeo Team, and also ride in large jackpots and slot races. I get my rodeo life from my dad’s side of the family, which have been in rodeo there whole life. My rodeo life did not start until I was around the age of five. At the time I rode a big white horse named Tilly. Now I know what you’re thinking… no pony? Yep that’s right got straight on a regular sized horse. By the time I was 7 I learned how to swing a rope. I ended up loving the spectrum of rodeo ever since. Whether it is breakaway roping or barrel racin’ there is not on event in rodeo that I can’t do. I also do plan on attending college to become and equine surgeon, and college Rodeo. I would also like to follow the professional rodeo circuit to make it to the NFR in barrel racing and team roping. Practice is the number one thing on my list every day. I wake up, practice. Not a day goes by when I don’t have a rope in my hands or on my horses. . I’ve told myself time and time again, that practice is the lead to success and beats luck any day. Even if it’s raining, or pouring, I’ll be there practicing, so my dreams can become a reality. I am one of the biggest believer in the saying "Never Give Up" and live by it every day. Keep your heads up cowgirls dreams do come true. "Hello! 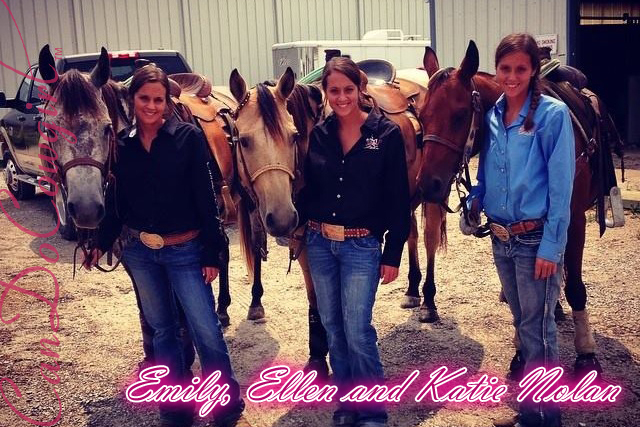 Our names are Ellen, Emily and Katie Nolan. We are 24 year old identical triplets from Dubuque, Iowa. We have been raised around horses and animals our entire lives! We started riding when we were two years old. Since then we have done everything there is to do horseback from showing horses western and english, jumping courses, 4-H, Wisconsin High School Rodeo, College Rodeo for the Great Plains region, Women’s Professional Rodeo Association, and are currently involved in the United States Team Roping Association, we also attend several local roping jackpot close to home. Our passion is team roping and breakaway roping. Some of our accomplishments in the arena are qualifying and competing at the National High School Finals Rodeo in Farmington, New Mexico in 2008, and competing in the USTRC Finals in the Cruel Girl Roping. Some of our accomplishments outside of the arena have been the most rewarding, for three years now we have been teaching students from an area high school the basics of horseback riding. While building relationships with each individual student we have learned a lot about life and the daily struggles and challenges people face every day. We also volunteered at our community Humane Society and Salvation Army Bell Ringers in past years. We are very proud of everything we have accomplished in and out of the arena, simply because of the memories and friendships made throughout the way...those are irreplaceable! We also help our parents John and Sue Ellen Nolan run our family business selling good quality horses, including developing and maintaining our website. We also lease horses to Girl Scout Camps across the state of Iowa. The three of us enjoy helping with the family business and have met some amazing people while working together with our parents. We are a very close family and the three of us couldn’t have accomplished all that we have without the support and love of our parents. They installed in us from a very early age that with hard work, dedication, commitment and the will to succeed, you can accomplish anything! Without them we wouldn’t have been given the opportunities to be able to do what we love! Throughout the week, you can find us in the arena practicing at least four to five days a week, working on our farm, spending time with family and friends, going to rodeos and jackpots, training horses, and spending quality time with all of our animals! Since graduating high school in 2008 Ellen started college at Northeast Iowa Community College and then transferred to University of Wisconsin Platteville. Majoring in agriculture business and minoring in accounting. Ellen graduated from college in 2012. Aside from working for an online stationary store, Ellen also loves to take photographs and has even started her own photography business! After graduating high school Emily started college at Northeast Iowa Community College and then transferred to University of Wisconsin Platteville, where she majored in agriculture business and minored in accounting, graduating in 2012. 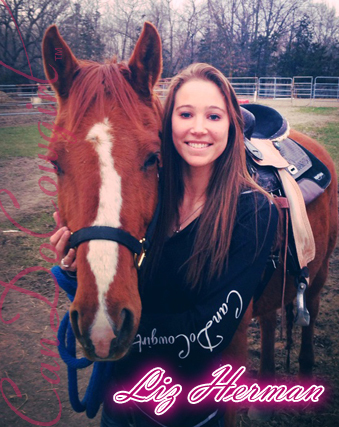 Along with her job, Emily also enjoys riding and training horses for many different disciplines! Attended college at Northeast Iowa Community College for two years where she then transferred to University of Wisconsin Platteville. While studying there she majored in criminal justice and minored in psychology. Aside from working at a preschool, Katie also gives horseback riding lessons to children and adults of all ages and absolutely loves it! "Katelyn Priddy is 5th generation rancher in the mountains of California. She believes in hard work and determination. 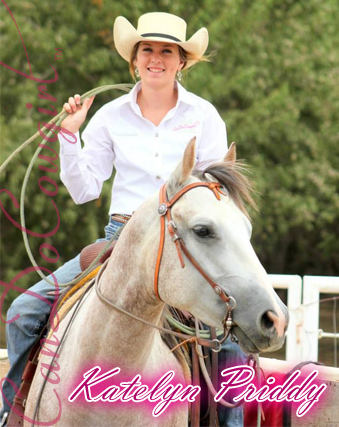 When Katelyn is not on the ranch you can find her at a JR rodeo, sorting or participating in rodeo queen competitions. She is an honor roll student and is very active in FFA. She looks forward to promoting CanDoCowgirl to the Western US." "My bio: Hey! My name is Heather, I live in the great state of Oklahoma! I'm BLESSED with 2 extremely handsome cowboys one my son Blayze and the other my boyfriend Ryan. Horses have a HUGE spot in all our hearts! We love rodeoing! Barrel racing, roping, sorting, team penning all the way to mutton bustin for my little guy! 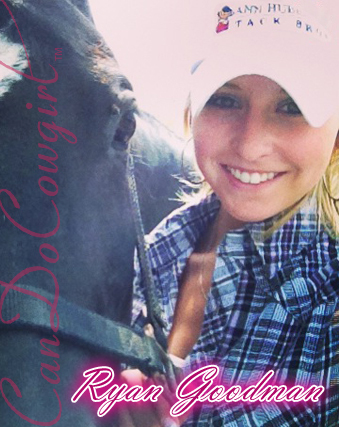 I'm really excited to be apart of the CanDoCowgirl Team!" 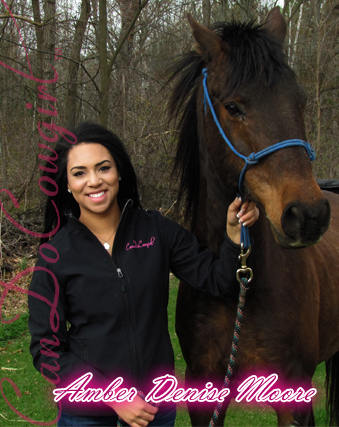 "Hi there, My name is Amanda & I am so excited to be on the Can Do Cowgirl Team! I am from Illinois and I grew up living and loving the Western lifestyle. I have been working as a Professional Model for three years, specializing in advertisements for Western Apparel. Aside from modeling in the equestrian market, I have competed and placed in the Miss IL USA Pageant organization, worked promotional jobs at Country Thunder Music Festival (huge country music fan!!! ), I have done televised events, magazine print and hair product ads, spokesmodeling and worked movie premieres. I love modeling and being a brand representative. It has enabled me to travel and get so know so many wonderful people! Aside from going to school and working, I am one of seven children in my family. I am very family oriented and love spending time with my family and friends on the weekends. I am also a huge animal lover! I have two Quarter Horses named Bandit & Pistol. I also have a dog named Lulu and two cats. In my free time, I enjoy going to rodeos, line dancing and attending country music concerts. I am currently studying to become a Special Education Preschool Teacher and I am working on attaining my Therapeutic Horseback Riding Instructor certification through PATH Intl. I have a passion for working with young children and animals. I have a younger brother with special needs and he has participated in many Special Needs organizations that have enabled me to get involved and volunteer. I enjoy working with children and animals because of the way both children and animals bring so much love and happiness to the people in their lives. I adore getting to see those benefits and it motivates me each day to continue on my career path. I feel blessed to have been given the opportunity to achieve so many goals in my life and to have many more that I can still work towards. I truly believe that growing up with horses set me up to be able to achieve my dreams. As a little girl, I knew I had to get up early to feed my horses before the school day, give it my all at school, get home to exercise them and care for them and then get all my homework done to start the next day. There are no off days when you grow up with horses. Rain or shine, blazing hot summer days or below zero winter weather, horses need to be cared for. They get sick, acquire huge vet bills, they teach you to manage your money and work hard. Being responsible for my horses from a young age taught me how to put others first, take special care of those in need, have a strong work ethic and never give up. All of the hard work and responsibility proves time and time again though that working hard pays off! Horses bring you so much happiness and I could not be more thankful to have them in my life. Representing this brand gives me the opportunity to share my story and learn from others. 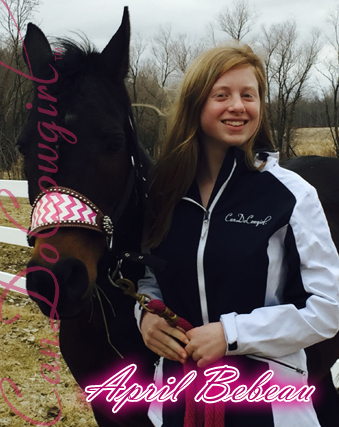 I am honored to be a part of the Can Do Cowgirl team because this line offers high quality, equestrian products with strong morals to stand behind it!" "Hi! My name is Hannah Clayton. I am 20 years old and currently reside on Fort Stewart, Georgia. I am an active duty Army medic and recently returned from my first tour in Afghanistan this past November. I am a military brat and have lived in 15 different places in my life. I've been riding and loving horses longer than I can remember. For years my family couldn't actually own a horse due to the constant moving, but my dad still found a way to keep me involved. I remember taking riding lessons while in Germany for three years. Eventually, we moved back to the states and we owned horses from then on out. I still didn't start competing competitively until I was about 15 and I was given my own horse Indy, a retired polo horse. I caught the barrel racing bug and ended up buying another horse, Cash, and would compete in the southern region of the united states until I graduated high school in May of 2011 and joined the U.S. Army when I would ultimately sell Cash. After all my training I was sent to Fort Stewart, Georgia to work as a medic in an aid station. At that time I discovered the N.C. Ranch in Ludowici, Georgia. The ranch owner took me in and taught me how to rope. Two years later I now help work and train their horses, and he lends me a 12 year old paint named "JC" to run barrels on until my two horses are finished. After returning from Afghanistan I bought a 2 year old bay colt named "Trick". Most recently, I bought "Roulette" a 3 year old black mare who I am currently in the process of training and "breaking", I plan on her being my barrel horse until Trick is old enough to compete at which point she will be my team roping and breakaway horse. Roulette, Trick, and I work hard every day at our goals. I look forward to helping out with the CanDoCowgirl Team!" "Hi! My name is Ryan Goodman. I am originally from the northern suburbs of Illinois and moved to Wyoming a little over a year ago. My dad first introduced me to horses when I was four and I have wanted to do nothing else except for that ever since. I competed competitively in the hunter jumpers since then and because of the amazing support from my family, especially my "Tutus", as well as all of the hard work that was put into competing and my horses, I was able to win nationals at the Washington International Horse Show in 2011. Winning nationals was the most amazing moment of my life and it really showed me how far determination and courage can go. Without determination and courage, I would not have gotten to the point I was at with my riding career and I also wouldn't have accomplished all that I have in my life and I am so thankful for that! When I moved to Wyoming, I wasn't able to jump anymore and I was really missing the competitive aspect in my life so I decided to start barrel racing. I just bought my first barrel horse, Ben, and I am so excited to see what this season will bring! 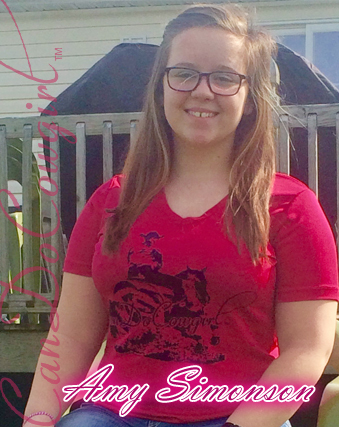 I am so happy to be part of the Can Do Cowgirl team!" "Hello! My name is Liz Herman and I'm part of the CanDoCowgirl team. My horse is Buddy, who's an 11 year old quarter horse. I have had Buddy for just about a month now, but we clicked together almost immediately. 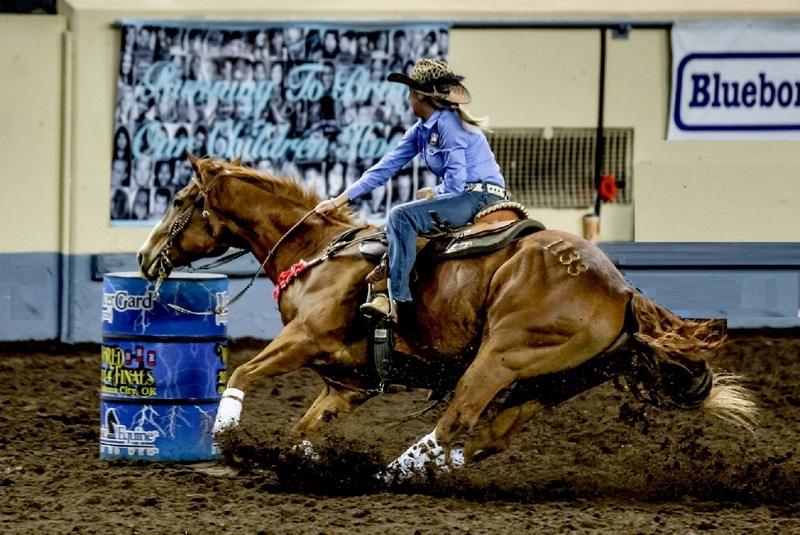 I compete in WSCA games but my focus is barrel racing. My showing process has been delayed for awhile, since I lost my first horse to colic, but Buddy has rekindled that fire and I'm ready to get to some serious competing. My goal is to inspire others to continue their dreams, no what life throws at you. It's tough, but worth it. 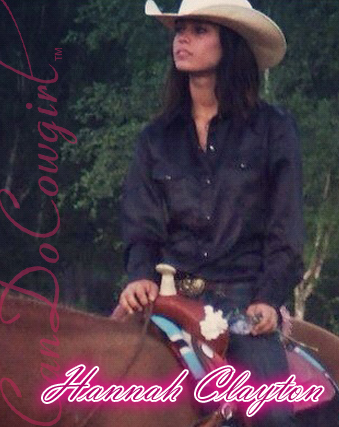 I'm proud to be a Can Do Cowgirl!" "Hello! My name is Carrie and I am 25 years old, a mother of two and a full time college student at Northland Tech! 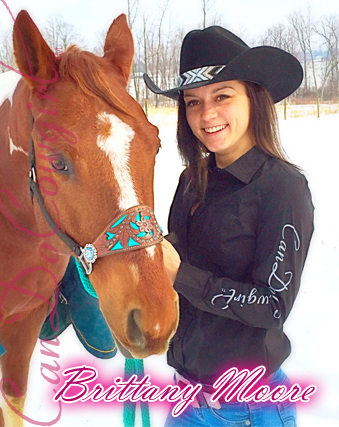 I compete in NBHA, UBRA and Blazin Barrels in Minnesota, South Dakota and Iowa. This year my biggest goal is to make it down to NBHA World Finals, as well as at UBRA World Finals! I am hauling a new horse named "Breaker" this season. 2014 is the start of a new journey with him & I am very much looking forward to it! Besides barrel racing I also compete in the MN Ranch Rodeo Assoc. around southern Minnesota. I wish everyone a successful and safe hauling season!"